I buy feta cheese at ridiculous prices here in Hyderabad and have it spoil while I make grand plans to use it inventively. A few days ago, I discovered a still fresh stash of feta in my fridge and cringed at how much I paid for it and how carelessly I kept it. That discovery hardly prompted me to do anything about it. I have been in a food funk lately and I won’t lie. The only food I am interested in cooking these days is to pack into K’s lunch. One day its a glass noodle salad (which he won’t eat, its for his colleagues), one day plain dal, rotis and sabzi. That apart, I’m eating leftovers. I have rocket lettuce growing out of control on my rooftop, I’ve neglected it beyond belief. I’m too lazy to go up and have left my plants un-watered for days on end. It is some wonder that they continue to grow. The watermelon lay in my fruit bowl alongside the apples, threatening to topple the bowl in which it sat since sunday and I wondered if I should just slice it up for Sage. I have an assortment of paper tea cups on my kitchen window. I have some lettuce, some garlic chives and radishes growing in them. The radishes I grow only for the leaves and it makes for an excellent rocket leaves substitute. 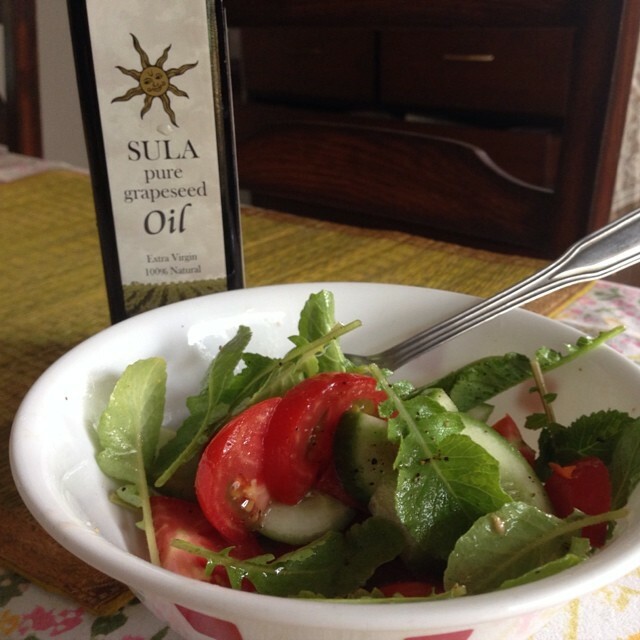 Yesterday, I was online after ages and was trawling my favourite food sites. Suddenly overcome with a fresh dose of guilt, I bolted to the kitchen to make lunch for myself. I gathered the watermelon with Sage underfoot, fished out the feta salad that lay languishing in the fridge and plucked out the lettuce from the paper cups (still too lazy to walk upstairs). 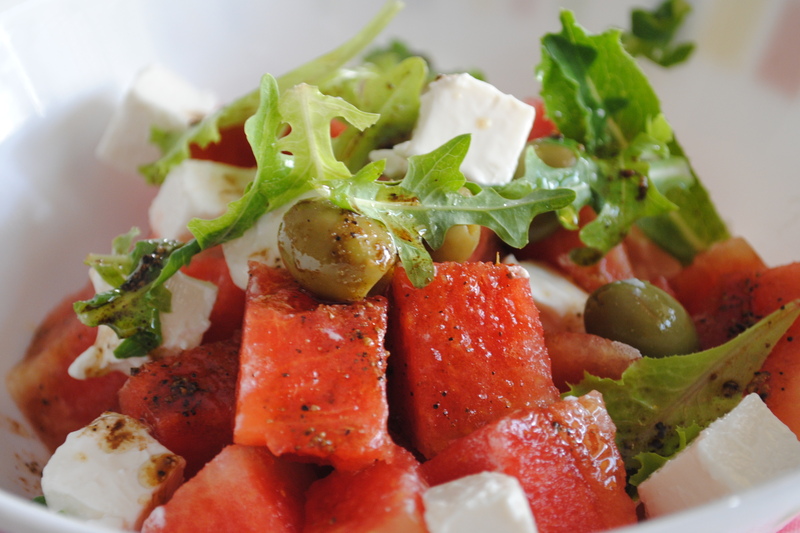 Watermelon Feta is one of the easiest salads to make. It is also the most forgiving. Usually onions and mint leaves are added. I don’t like either in salad so I skipped the onion and swapped out the scanty lettuce leaves for the mint. I’ve found fresh paneer to be quite a good substitute for feta. Add salt to the milk and make it freshly at home using this recipe for an easy replacement if you cannot source feta cheese where you live. In a small bowl, add the ingredients for the dressing and whisk well with a fork. Add the watermelon chunks, lettuce and olives and toss a bit. Pour half of the dressing over this and toss it. Add the cubed feta chunks and pour the remaining dressing over the feta cubes. Serve immediately. Make sure the watermelon chunks are chilled.